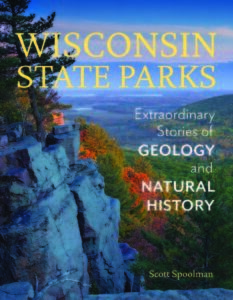 Wisconsin state parks: stories of geology and natural history - Scott Spoolman introduces you to Wisconsin’s fascinating geology and natural history by taking you through the gateways to the ancient past that can be found in Wisconsin’s extraordinary State Parks and State Forests. This presentation includes an overview of the state’s ancient history from the time when the continents were forming to the earliest days of human habitation of the area that would become Wisconsin. There follows a quick tour of five regions of the state with a look at the deep history of each region. Finally, the author takes us on a hike through one of the parks to show how his book can be used to understand the geology and natural history of the parks and their surrounding areas. The talk includes a look at the author’s trail guides, which give hikers a first-hand account of what the author learned on his trips to the park. The presentation includes displays of several of the author’s own photographs, which appear throughout this collection of 28 state park and state forest stories.